FODMAPs carbohydrates are basically several different types of fiber that can upset your digestive system: if you’re having trouble with bloating, constipation, diarrhea, or other digestive upsets, FODMAPs elimination is a great first step in your troubleshooting. Grains (including corn), legumes (including peanuts, peas, and beans), dairy (except butter and ghee), seed oils, and alcohol. Onion/garlic family: Garlic, leeks, onions, and shallots. Also watch out for spice mixes that contain onion and/or garlic powder. Other vegetables: Artichoke, asparagus, cabbage, okra, snow peas, sugar snap peas, radicchio, tomato paste (but ordinary toma- toes are fine). Pistachios, almonds, hazelnuts, and large amounts of any kind of nut, nut flour, or nut butter. Stone fruits: Apricots, cherries, nectarines, peaches, and plums. Other fruits: Apples, blackberries, grapes, mango, pears, persimmons, and watermelon. Dried fruit, fruit juices, honey, any kind of sweetener (even 0-calorie sweeteners). People who are extremely sensitive to FODMAPs may also need to avoid some additional foods that contain fewer FODMAPs carbohydrates; a great list including these foods is here. The list is pretty long, so read it over a couple times to get your bearings, and then check out the tips below for cooking low-FODMAPs recipes without losing your mind. There are two parts to this section. Part 1 has recipes that are low-FODMAPs exactly as written. 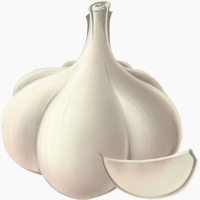 Part 2 has some strategic substitutions for onions and garlic, to help you modify recipes without losing flavor. On this list, recipes without a * use only ingredients that are considered totally safe. Recipes with a * also include ingredients that are considered safe in small amounts. If you’re extremely sensitive to FODMAPs, then avoid the recipes marked with the *, but most people should be fine with them. * Zucchini and sweet Potato Frittata (sweet potatoes are on the “caution” list, but you could always replace them with white potatoes, which are completely safe). Infused oils. The FODMAPs themselves aren’t fat-soluble, but the chemicals that give onions and garlic their flavor are. So oils infused with onion or garlic give you all the flavor without the stomachache. Make your own at home by heating on- ions and/or garlic in oil (and then storing any extras in the fridge), or get pre-made infused oils at the grocery store. and garlic. Beware when you’re using it: a little bit goes a long way, so err on the side of stinginess. The celery isn’t for flavor, but if you miss the texture of onions as well as the taste, well-cooked celery is a decent substitute. Below are some recipes where you could use these substitutions to good effect. In general, if you just want the flavor (as in a marinade), the infused oils are the best choice; if you want the texture as well, go for the asafetida and celery. Another tip is that if you’re using leeks or scallions, it’s perfectly safe to use just the green tops, since all the FODMAPs are in the bulb. So for example, in the tuna burger recipe or for lomi lomi salmon, you can prepare it exactly as written but just make sure to use only the tops of the scallions. Hopefully this collection of recipes is helpful to anyone trying a low-FODMAPs diet or even just a 30-day elimination. Reducing FODMAPs in your diet doesn’t mean you have to do without delicious food!